Children learn a lot by example, and certain habits tend to make the best impression when they are part of a routine. For instance, children are more likely to develop an interest in reading if they see their parents reading by example. When it comes to routine, children may grow accustomed to reading at a certain time of day which helps instill the act of reading as an important part of their lives. This can apply to other things too: children are more likely to eat healthy if they see their parents eating that way. The same goes for other habits and interests that parents feel may be beneficial for their children. As the summer holidays near, parents may be wondering how they can encourage their kids to do something meaningful, and by making it part of your routine, you can help your children grow into well developed individuals. Aside from planned vacations, there are plenty of things that families can do together during the summer holidays, yet not many people may realize just how fun, fulfilling and inspiring it can be to spend some time with your family while you also help your community. ● Does your family have a favorite park or hangout spot? The next time you plan an outing, see if there’s anything that you can do for this community space. Do they need any assistance cleaning up or setting up activities? Cleaning is a great skill, especially for children who are just learning how to pick up after themselves as independent individuals while also learning to complete other tasks on their own. Cleaning up and helping others is a great way to teach accountability and compassion. ● Is there a local pet shelter near your home? If your kids love animals, volunteering at shelters is a great way to provide your children with opportunities to play with them as well as help them out, and it can be especially beneficial for kids who may not have pets at home. Unadopted pets need love and your family, as well as your children, can help shelters out by playing with the animals, taking them for walks, or completing other tasks in order to help improve the lives of these animals. You might find that doing so just might help to improve your own life as well! ● Do you have a yard or is there a garden close to your home? 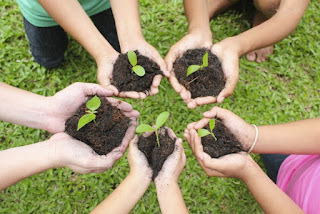 Planting trees with your children can help impart the idea that taking care of the earth is important, and that even planting one tree can make a difference and help the planet. ● Parents can also encourage kids to donate. As the new school year approaches, your children may want new school supplies. Encourage them to gather the things that they may no longer want, such as last year’s backpack or the pair of sneakers they outgrew, and go along with them as they donate these items to other children in need. There are plenty of other things that you can do to give back with your kids, but remember, by making it a part of your everyday and by leading by example, parents can help make a huge difference in their child’s lives and it can even encourage them to make a positive difference in other people’s lives as well.